Nottingham Medlar is one of the best examples of this once-popular fruit. Medlar trees are somewhat similar in appearance to a spreading apple trees. The branches often grow in an interesting and fashion and the leaves are attractive in the autumn. 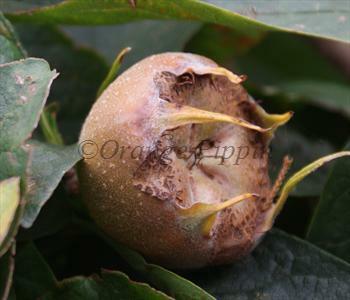 Nottingham Medlars are primarily grown for their culinary value. However they can be eaten fresh - pick the fruit in late October, then store them in a cool dark place for 3-4 weeks to allow them to "blet". The flesh should then be a soft squidgy mush, similar to a ripe date. Please fill in the details below and we will let you know when Nottingham medlar trees are back in stock. Pick in October then leave to ripen? Nottingham is self-fertile and does not need a pollination partner, although fruiting may be improved if there is a compatible tree of a different variety nearby. Nottingham Medlar is easy to grow and well-suited to the UK climate. However for best cropping, a sheltered location with a sunny aspect will give better results.